We’re always busy in Philadelphia! The next few weeks have a (tech) stacked calendar for our Philly team, from the Women in Tech Summit to some fun meetups. As the lead technical recruiter for Vistar in the Philly area, I always enjoy when we have the opportunity to get involved in local events as well as give back to the tech community. To learn more about the happenings we have coming up this month, check out the calendar below. 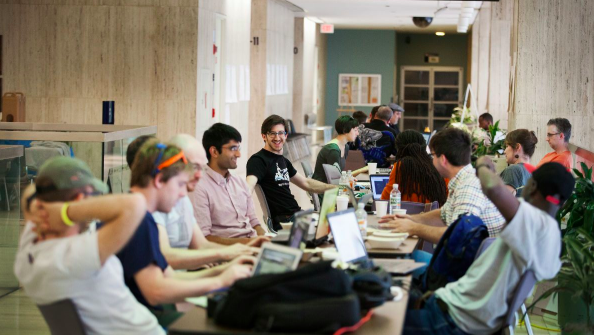 Vistar will be hosting our first event in the new office on April 9th: Code for Philly's Hack Night! Code for Philly is a community of civic technologists, using tech, data and design as a means of civic engagement. This is a no-frills night for projects – to meet in-person and get some real work done. Code for Philly projects are all free, open source, and operate in the civic space. We're looking forward to a night of snacks and coding to benefit our community! Vistar is back for the second year as a sponsor for the Northeast Women in Tech Summit at the Science History Institute. This two-day event brings together women at every level, from students to senior executives, to connect, educate and inspire. The conference includes hands-on tech workshops, discussions about trending topics in tech, and information on thriving through tech career phases and facets. WITS connects women working on the business and technical sides of the industry. This year, four Vistar women will be attending and we can’t wait to see you there! DataPhilly is a community-run group for anyone interested in gaining insights from data.The topic of this particular evening is the open science movement and how it is impacting the traditionally closed world of biology research, featuring a talk by Olga Botvinnik – a bioinformatics scientist and advocate for open data and open science. She will be sharing some insights from her research and also her career experiences more generally. Vistar will be providing food and drinks for this meetup, so we hope you can join us for an educational evening! Last, but certainly not least, we're looking forward to our first year as sponsors for the Philly ETE conference at the Sheraton Society Hill Hotel! The Emerging Technologies Conference has brought the leaders of the open source community to Philadelphia to teach about their projects, their work and how these technologies are changing software development. Over the last 12 years, ETE has become one of the largest gatherings of developers in the mid-Atlantic. Interested in working for Vistar Media?